Thoughts On Three Famous 'Language Apes' : 13.7: Cosmos And Culture The apes Koko, Kanzi and Panbanisha are famous for their language abilities. Commentator and anthropologist Barbara J. King considers whether these abilities are being blown out of proportion with reality. Koko, Kanzi and Panbanisha are about as famous as three apes can get. 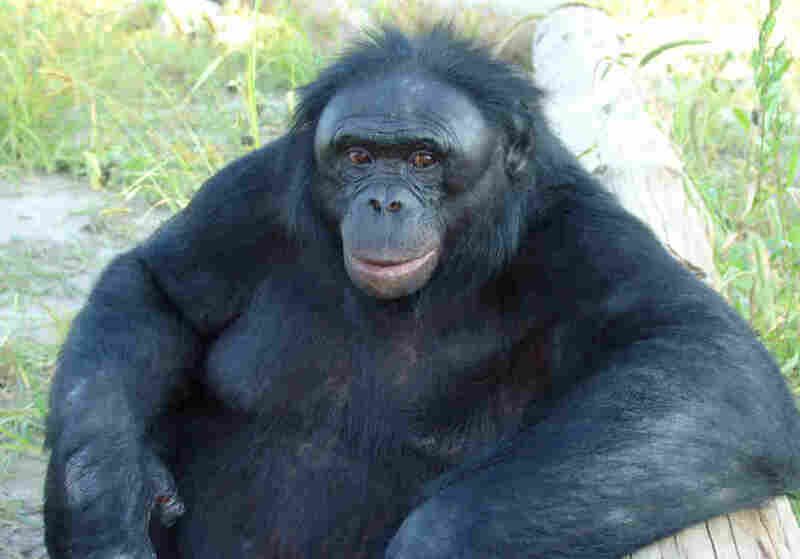 Born in 1971 and trained in the use of some American Sign Language, Koko lives at the Gorilla Foundation in California. Once a National Geographic "cover ape", this kitten-loving gorilla became a celebrity as an intriguing interview subject. Born in 1980 and 1985 respectively, Kanzi and his half-sister Panbanisha became primate mega-stars when these bonobos picked up from human caretakers how to communicate with computer symbols called lexigrams — without being explicitly tutored in the system. Raised at Georgia State University's Language Research Center, though now residing at the Great Ape Trust / Bonobo Hope Sanctuary in Iowa, they, like Koko, understand some spoken English. Koko, a female, is now 41. Kanzi, a male, is 31 and Panbanisha is 26. Their behaviors reveal the expansive powers of the ape mind. Now, though, it seems that these apes are increasingly imbued with communicative and cognitive powers that strain credulity. For decades, the Gorilla Foundation, run by the scientist Penny Patterson, has maintained — based on Koko's own use of sign language — that Koko would like to have a baby. Recently the Foundation posted this video clip, in which Koko is presented, verbally and in diagram form, with four complicated choices about "family planning." Patterson, at the end of the clip, affirms her interpretation that Koko grasped all of the options presented to her. The idea is that Koko, by pointing to one of the four diagrammed choices, can and should help make decisions that involve the reproductive activities and the welfare of other gorillas. This raises ethical issues, to say the least. "When we, with the proper tools, make the proper scientific advancements, Kanzi will be here talking to you himself, and I look forward to that day." Savage-Rumbaugh may not refer here to Kanzi using speech, but instead to his communicating with lexigrams. This point is unclear to me because in the book Kanzi's Primal Language and elsewhere, Savage-Rumbaugh and co-authors do suggest that Kanzi can utter some words. The medium of communication isn't the point, though; it's that one of Savage-Rumbaugh's goals for Kanzi is to have him talk knowledgeably with the media. These three apes' fate, for better or worse, is to live in a human environment as participants in communicative and cognitive science projects. In that context, we would honor Koko's, Kanzi's and Panbanisha's accomplishments best by acknowledging that even these apes cannot fully grasp or communicate about the complexities of our world — as indeed, I would maintain, we cannot fully grasp or communicate the complexities of theirs. Afterword from Barbara: I have learned that an investigation is underway into the concerns aired about Sue Savage-Rumbaugh's conduct at the bonobo sanctuary in Iowa. I was interested to read in an American Association for the Advancement of Science news report that theologian and ethicist Nancy Howell is to take charge of this investigation. In light of what I've written above, this development is notable. Howell is not a scientist. Her work (which I have heard her present at a scholarly conference) includes reflections on bonobos as a window to understanding the sacred and the transcendent in human life. Whether she is equipped to interpret appropriately the behavior — and needs — of apes remains to be seen.